3M 1100 UF foam ear plugs are the stiffest of the poly-urethane foam ear plugs. The surface of each ear plug is smooth and non-irritating, making it comfortable enough for all-day wear. 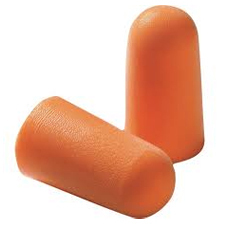 Like most UF foam ear plugs, these feature a popular bell shape for easy roll-down and insertion. The stiffer foam is also easier to insert than some softer foam plugs. Hearing protection ear plugs are ultimately only as good as their fit is; without a good and proper fit, the plugs can't form an effective seal against noise. For those who like the feel of UF, but want the stiffness of PVC (which makes getting a proper fit a little easier), the 3M 1100 is a good choice. 3M 1100 UF Foam Ear Plugs (NRR 29)5MaryApril 19, 2018They are stiff and wide for large ears. Perfect! 3M 1100 UF Foam Ear Plugs (NRR 29)4SpeedyJanuary 25, 2017I have used these ear plugs as a light sleeper. But one word of caution,; others suggest wetting them before insertion with your saliva. Don't do that as it transfers bacteria from your mouth to the ear plug and infection can occur, especially after re-use. Instead wet them using tap water and dry them a bit before insertion. 3M 1100 UF Foam Ear Plugs (NRR 29)5Al EricksonFebruary 1, 2016I have used these ear plugs for years when motorcycle riding and when using power lawn equipment. Just roll the end to a taper,moisten,and insert. 3M 1100 UF Foam Ear Plugs (NRR 29)5MaryJuly 14, 2014I have used these for many years for sleeping and they have worked really well keeping out the sounds of snoring, etc. I used to be able to use them for several nights before discarding. It seems now that the foam is made differently and they will only work one, maybe two times. 3M 1100 UF Foam Ear Plugs (NRR 29)5L. KayMarch 21, 2012I've used these ear plugs for years and have twice ordered them online at earplugstore.com. The shipments (to Canada) have come quickly and well packaged. 3M 1100 UF Foam Ear Plugs (NRR 29)5Al EricksonMay 31, 2011I use these ear plugs when doing yard work with power tools and when riding my motorcylce. These ear plugs are the most effective foam type plugs I have found. 3M 1100 UF Foam Ear Plugs (NRR 29)5DanNovember 11, 2010I have tried a lot of different earplugs to block out night sounds because I am a very light sleeper. These earplugs are the best I have ever tried. A hint to anyone contemplating the purchase of these, you can get on average 3-4 nights use from one pair. After rolling them with your finger preparing for insertion, moisten the tip with your tongue. They go into the ear canal much easier that way.